Back from left: Chris Todd, Dawn Fairlamb, Zoe Lewis and Tony Lewin. 'Front from left: Gerard Garvey, Suzanne Duncan, Natalie Davison-Terranova, Darren Hankey, Dr Lindsey Whiterod and Kate Roe. Photo by Barry Pells. College principals, staff and students from across the North East are set to march on Parliament over funding. This unprecedented joint action will see college CEOs protest alongside colleagues, learners and education unions in a rally at Parliament Square next Wednesday. The demo is part of a coordinated national campaign by the Association of Colleges, National Union of Students, Association of College and School Leaders, University and Colleges Union, Unison, GMB, TUC and National Education Union. ‘Love Our Colleges’ is calling on the Government to increase 16-19 funding by 5% a year for five years and provide additional ring-fenced funding for pay, reversing cuts over the past decade which have seen college funding cut by 30%. The campaign, part of the Colleges Week celebration from October 15 to 19, follows a report from the Institute of Fiscal Studies which shows funding for students in school sixth forms and FE colleges has been “severely squeezed” since 2010. It said while funding for early years has gone from almost nil to £3billion since the early 1990s, and spending per student in higher education has risen by nearly 60% since 1997, there has been an “almost complete lack of growth in spending on further education”. The report found funding per student in sixth forms is now at its lowest level since 2002-03. 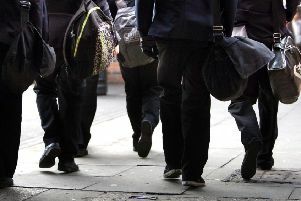 The Association of Colleges says the impact of the cuts has included fewer hours of teaching and support for young people, a drastic reduction in the number of learning opportunities for adults and the value of staff pay falling by over 25% since 2009. As well as increasing funding, it is calling on the Government to extend the pupil premium to cover post-16 students, fund a National Retraining Scheme, introduce a lifetime learning entitlement to fund skills training for all adults and provide fair pay deals for college staff. Further education and sixth form colleges from across the North-East are supporting the campaign, including East Durham College, Hartlepool College of Further Education, New College Durham, Sunderland College and Tyne Coast College (South Tyneside College and Tyne Met College). Ellen Thinnesen, Principal of Sunderland College, said: “For the sector to continue to be a driving force in the development of a higher skilled workforce, colleges need to be able to invest in their people, resources and facilities. This is only possible through a more realistic funding mechanism that better supports colleges." Dr Lindsey Whiterod, Chief Executive of Tyne Coast College (South Tyneside College and Tyne Met College), said: “Funding cuts continue to impact on colleges, undermining the ambition we all share to give the best possible education and training to learners. Caroline Rowley, Area Director (North East) at the Association of Colleges, said: “Colleges are critical to economic prosperity and do so much to improve the skills of the 2.2 million people learning in these institutions every day. But for colleges to continue to be able to provide outstanding provision, they need to be funded adequately. “We need to stop short-changing our students if we’re to have the economy we need, especially with Brexit looming."